Fort Huachuca, Arizona - Throughout the Vietnam War, the Army was concerned with the expeditious return of prisoners-of-war (POWs) and an accounting of those missing-in-action (MIA). The U.S. knew that many of its personnel were being held in dangerous and unhealthy conditions, but North Vietnam released little information about American Servicemen in its POW camps. When Richard Nixon won the U.S. presidency in 1968, he and his secretary of defense announced a diminishing role for the U.S. military in Vietnam. When peace negotiations commenced, the Department of Defense (DoD) began planning Operation EGRESS-RECAP, the repatriation of American personnel. When the Paris peace accords were signed on Jan. 27, 1973, the United States and North Vietnam agreed to a mass release of all POWs. At that time, the secretary of defense renamed the repatriation program Operation HOMECOMING, a more apt description of the mission. 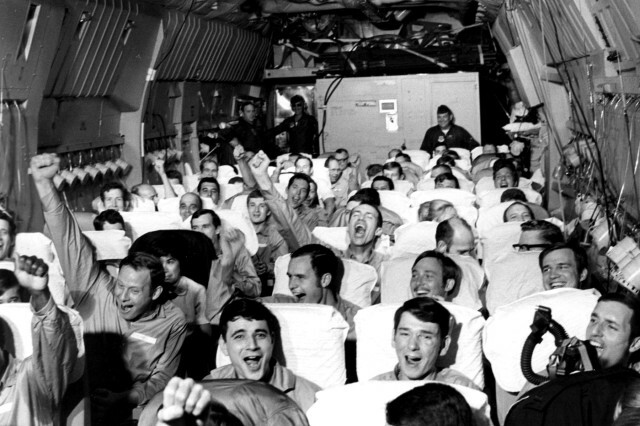 From February through March, North Vietnam released 566 American military personnel, including 513 of the 591 listed by DoD as POWs and 53 others carried as MIA. Twenty-five civilians were also returned. Seventy-six of the returnees were U.S. Army Soldiers. Phase I of Operation HOMECOMING was the actual repatriation. Phase II began when the POWs arrived at Clark Air Force Base in the Philippines. There, they were given physical and mental evaluations, necessary medical treatment, and were taken to the base exchange to purchase supplies. They also called home for the first time since they had been taken prisoner. Each service conducted debriefings with their returnees immediately upon their arrival at Clark. Counterintelligence agents with the 500th MI Group conducted all debriefings with repatriated Army personnel. The DoD recognized the criticality of identifying additional captives remaining in North Vietnamese camps. Therefore, Phase II debriefers primarily collected the names of others within the prison system. Because the returnees had memorized the names of prisoners who came and left the camps, they proved the best source of information about casualties and survivors. More-detailed Phase III debriefings later took place at various hospitals in the U.S. Seven MI groups -- the 108th, 109th, 111th, 112th, 113th, 115th, and 116th -- of the US Army Intelligence Command (USAINTC) assigned counterintelligence agents to conduct the Phase III debriefs. Two-man teams were carefully matched to the rank, background, and interests of the returnees. To help establish rapport with their assigned returnee, each team underwent significant training emphasizing the psychological impact of the confinement experience on the returnees. During Phase III debriefings, the returnees answered additional questions on names they had given during their previous debriefings. At this time, they were also given the opportunity to tell "their story" of their capture and confinement. Final agent reports detailed not only information about additional POWs or MIA personnel but also enemy camp security, interrogation and indoctrination techniques, and medical care. One of the returnees was Capt. Floyd "Jim" Thompson, the longest held POW in U.S. history. Thompson was the team lead of a 12-man intelligence-gathering unit. On March 26, 1964, he was on an aerial observation mission in South Vietnam when enemy small arms fire brought down the O-1 Bird Dog aircraft in which he was a passenger. When North Vietnam released him on March 16, 1973, Thompson had spent just short of nine years as a POW. Agents from the 109th MI Group debriefed him at Valley Forge General Hospital in Pennsylvania. Thompson retired from the Army as a lieutenant colonel in 1981. Another returnee, Capt. Theodore W. Gostas, was an intelligence officer with the 135th MI Battalion in South Vietnam at the time of his capture during the Tet Offensive in February 1968. He spent 1,871 days in captivity at the Hanoi Hilton before his release on March 16, 1973, as part of Operation HOMECOMING. He spent several days at Fitzsimmons Army Medical Center, Denver, Colorado, being debriefed by special agents from the 115th MI Group. Gostas continued his Army service until his medical retirement as a major in December 1977. Sergeant 1st Class Don Rander, a CI agent, was captured with Gostas and also spent four and a half years in captivity. He recuperated at Valley Forge General Hospital while being debriefed by agents from the 109th MI Group. Rander retired from the Army in 1983 as a chief warrant officer 3 and then continued to serve MI as a civilian until 2003. Based on information provided by the returnees, the DoD determined that all of the men known to be in the enemy's prison system either came home during Operation HOMECOMING or were accounted for at that time. As of late November 2015, the DoD continued to track 516 unaccounted-for U.S. Army personnel. Of those, 21 are believed to have been prisoners who died while in captivity but whose remains have not been recovered. The Defense POW/MIA Accounting Agency continues to investigate and recover the remains of Service members from the Vietnam War, as well as other combat operations.